To Cite: Mozafari M, Nekooeian A A, Panjeshahin M R. The Antihyperlipidemic Effects of Resveratrol in Rats with Simultaneous Type II Diabetes and Renovascular Hypertension, Int Cardio Res J. Online ahead of Print ; 10(4):e9804. Background: Resveratrol has beneficial effects on experimental and clinical hypertension and diabetes. Objectives: This study aimed at examining antidiuretic and antihyperlipidemic effects of resveratrol in rats with simultaneous type II diabetes and endovascular hypertension. Methods: This study was performed on eight groups of male Spargue-Dawley rats each containing 8 - 10 animals as follows: control, diabetic (induced by streptozotocin and nicotinamide), renovascular hypertensive (induced by placing Plexiglas clips on the left renal arteries), sham, simultaneously hypertensive-diabetic receiving vehicle (distilled water), and 3 simultaneously hypertensive-diabetic groups receiving 5, 10, and 20 mg/kg/day resveratrol. Blood pressure and heart rate were measured weekly and fasting blood glucose, serum cholesterol, triglyceride, and markers of oxidative stress were measured after 4 weeks of treatment with resveratrol vehicle. The data were analyzed using one-way analysis of variance (ANOVA) and Duncan’s multiple range tests. Data analysis was done using SigmaStat software and P ≤ 0.05 was considered to be statistically significant. Results: Serum malondialdehyde, systolic blood pressure, heart rate, fasting blood glucose, blood glycated hemoglobin, and serum triglyceride, total cholesterol, and low-density lipoprotein cholesterol levels were significantly higher in the hypertensive-diabetic group receiving vehicle compared to the control group (P < 0.05) and treatment with resveratrol significantly reduced these variables (P < 0.05). On the other hand, serum superoxide dismutase, glutathione reductase, and high-density lipoprotein cholesterol levels were significantly lower in the hypertensive-diabetic group receiving vehicle compared to the control group (P < 0.05) and treatment with resveratrol significantly increased these variables (P < 0.05). Conclusions: The findings indicated that resveratrol had antidiabetic, antihypertensive, and antihyperlipidemic effects, which might be partly due to an antioxidant mechanism. Diabetes, clinical and experimental, is associated with impaired lipid metabolism and hyperlipidemia. It is also associated with increased serum levels of very low-density lipoprotein cholesterol (VLDL-C) (1), low-density lipoprotein cholesterol (LDL-C) (1, 2), total cholesterol (TC) (1, 3), and triglyceride (TG) (1, 3) and decreased serum levels of high-density lipoprotein-cholesterol (HDL-C) (1, 3) in both humans (4) and experimental models (1, 3). Moreover, the prevalence of atherosclerosis, the leading cause of myocardial infarction (4) and stroke (5), is 2-5 times higher is diabetic patients than in non-diabetics (6). The prevalence of hypertension is also higher in diabetic patients compared to non-diabetics (6, 7), and coexistence of the two diseases is associated with higher cardiovascular risk and mortality in humans (6). Despite consuming high-fat diets, individuals from southern France had a lower cardiovascular morbidity and mortality. This phenomenon, referred to as French paradox, has been attributed to resveratrol (3, 5, 4-trihydroxystilbene), a polyphenolic component of red grapes skin (8). Resveratrol was shown to decrease TG (9), LDL-C (10), and TC (11) and increase HDL-C (11) in healthy individuals and diabetic (12), hypertensive (13), and high-risk (10) patients. It also decreased TG (9), TC (12), VLDL-C (12), and LDL-C (9) and increased HDL-C (12) in healthy (12) and diabetic (14) animals. The beneficial effects of resveratrol on serum lipids have been attributed to decrease of hepatic activities of lipogenic and cholesterogenic enzymes, such as fatty acid synthase (15), triacylglycerol synthetase (15), glucose 6 phosphate dehydrogenase (16), and 3-hydroxy 3-methyl glutaryl coenzyme A (HMG COA) reductase (16), and inhibition of leptin secretion from adipocytes (17). Simultaneous occurrence of hypertension and diabetes has been widely detected in humans. Nevertheless, simultaneous presence of the two diseases has not been extensively studied in animal models. Also, the possible lipid lowering activity of resveratrol has not been investigated in an experimental model of simultaneous type II diabetes mellitus and renovascular hypertension. The present study aims at examining antidiabetic and antihyperlipidemic effects of resveratrol in rats with simultaneous type II diabetes and renovascular hypertension. It also aims to determine whether resveratrol’s antioxidant property is involved in its possible lipid lowering effects. Male Sprague-Dawley rats (n = 80) weighing 200 - 250 g were obtained from Laboratory Animal Breeding Center, Shiraz University of Medical Sciences, Shiraz, Iran and were kept under standard conditions (light⁄dark cycle: 12 hours, humidity: 25 - 35%, and temperature: 20 - 22°C) with standard diet and water ad libitum. All the procedures were approved by the University Committee for Care and Use of Animals. The rats were injected intraperitoneally with 110 mg/kg Nicotinamide (NA) (Sigma-Aldrich chemical Co., Steinheim, Germany) and 65 mg/kg Streptozotocin (STZ) (Teva Parenteral medicine Inc., Irvine, CA, USA) or distilled water as vehicle. Seven days later, the animals’ blood glucose levels were determined using a glucometer (Accu-check® active, Germany) and those with fasting blood glucose (FBG) levels higher than 126 mg/dL were considered to have type II diabetes (18). The experiments were conducted as previously described (19). Four weeks after injection of the vehicle, control and type II diabetic animals were subjected to sham-operation or induction of two-kidney, one-clip renovascular hypertension by placing self-made solid Plexiglass clips on the left renal arteries as previously described (20). Briefly, the animals were anesthetized with 60 mg/kg ketamine (Pan Pharam, Trittau, Schleswig Holstein, Germany) and 8 mg/kg xylazine (Alfasan, Woerden, The Netherlands). Through left flank incisions, the left renal arteries were exposed and dissected away from the renal veins and the surrounding tissues. Afterwards, Plexiglass clips (internal diameter of 0.20 - 0.22 mm) were placed on the arteries. Penicillin powder (Jaber Ebne Hayyan, Tehran, Iran) was applied to the incision sites and abdominal wall and skin were closed using absorbable (catgut) and non-absorbable (silk) suture materials, respectively. The sham-operated animals were subjected to a similar procedure, but no clip was placed around their renal arteries. The animals were then recovered from anesthesia and kept in cages of two rats each for 4 weeks under standard conditions (21). Starting from the day after the operations, 8 groups of animals emerged, including a diabetic control group assigned to receive distilled water as vehicle (DMC-V), a sham group for renovascular hypertensive rats assigned to receive the vehicle (Sham-V), a renovascular hypertensive group assigned to receive the vehicle (HTN-V), a type II diabetic group assigned to receive the vehicle (DM-V), a simultaneously type II diabetic and renal hypertensive group assigned to receive the vehicle (DM+HTN-V), and 3 simultaneously type 2 diabetic and renal hypertensive groups assigned to receive resveratrol (R) (Serva Co, Oklahoma, USA) at 5 (DM+HTN-R5), 10 (DM+HTN-R10), or 20 mg/kg/day (DM+HTN-R20) in the same volume of the vehicle. The vehicle or resveratrol was administered by oral gavages for the next 4 weeks. On days 7, 14, 21, and 28, systolic blood pressure (SBP) and heart rate (HR) were measured using non-invasive tail-cuff method (Chart 5.0 software, PowerLab 4/30, AD instruments Inc., MA, Australia). Three consecutive blood pressure measurements, which had a difference of less than 5 mmHg, were considered to be valid. Such three measurements were averaged and their means were taken as blood pressure values at each time. Then, a drop of tail blood was obtained for measurement of FBG using a glucometer (Accu-check® active, Germany) (19). After measurement of SBP and HR, the animals were anesthetized with 70 mg/kg thiopental sodium (Biochem GmbH, Vienna, Australia). Blood samples were then obtained for measurement of FBG and serum levels of Malondialdehyde (MDA), Superoxide Dismutase (SOD), Glutathione Reductase (GR), TG, TC, LDL-C, and HDL-C. The samples obtained for measurement of serum MDA, SOD, GR, TG, TC, LDL-C, and HDL-C levels were allowed to clot for 30 minutes, centrifuged at 3000 rpm for 20 minutes, and their sera were separated and stored at - 80°C until analysis (19, 21). Serum level of MDA was determined using MDA ELISA kit (Bioassay technology laboratory, Shanghai, China). Serum levels of SOD and GR were also assessed using Biorexfars chemical kits (Shiraz, Iran). Besides, serum levels of TG, TC, LDL-C, and HDL-C were determined using Pars Azmun commercial kits (Pars Azmun Co, INC, Karaj, Iran). Finally, hemoglobin A1c level was evaluated using Biorexsfars chemical kits (Biorexsfars Co, Shiraz, Iran) (19). The study data, presented as mean ± SEM, were first examined for normal distribution. They were then analyzed using one-way analysis of variance (ANOVA). Where a significant difference was obtained with one-way ANOVA, the source of difference was located using Duncan’s multiple range test. P ≤ 0.05 was considered to be statistically significant. All the statistical analyses were performed using SigmaStat statistical software, version 3.0 and illustrations were prepared using SigmaPlot software (version 8.0) (San Jose, CA, USA). The weekly SBPs of all the study groups have been shown in Figure 1. Abbreviations: DM-V, diabetic receiving vehicle; DMC-V, diabetic control receiving vehicle; DM+HTN-R, diabetic-hypertensive receiving resveratrol at 5 (R5), 10 (R10), or 20 (R20) mg/kg/day; DM+HTN-V, diabetic-hypertensive receiving vehicle; HTN-V, hypertensive receiving vehicle; Sham-V, sham-operated receiving vehicle; *Significantly different (P < 0.05) from DMC-V or Sham-V; ∆Significantly different (P < 0.05) from DM+HTN-V. Accordingly, there was no significant difference among DMC-V, DM-V, and Sham-V groups regarding SBP at weeks 1, 2, 3, and 4 of treatment with the vehicle. Nevertheless, SBPs of the HTN-V and DM+HTN-V groups were significantly (P ˂ 0.05) higher than those of the relevant control groups and the DM-V group at such times. Additionally, SBP was significantly lower in the DM+HTN-R5, DM+HTN-R10, and DM+HTN-R20 groups compared to the DM+HTN-V group at such time points (P ˂ 0.05). The weekly HRs of all the study groups have been presented in Figure 2. Abbreviations: DM-V, diabetic receiving vehicle; DMC-V, diabetic control receiving vehicle; DM+HTN-R, diabetic-hypertensive receiving resveratrol at 5 (R5), 10 (R10), or 20 (R20) mg/kg/day; DM+HTN-V, diabetic-hypertensive receiving vehicle; HTN-V, hypertensive receiving vehicle; Sham-V, sham-operated receiving vehicle. 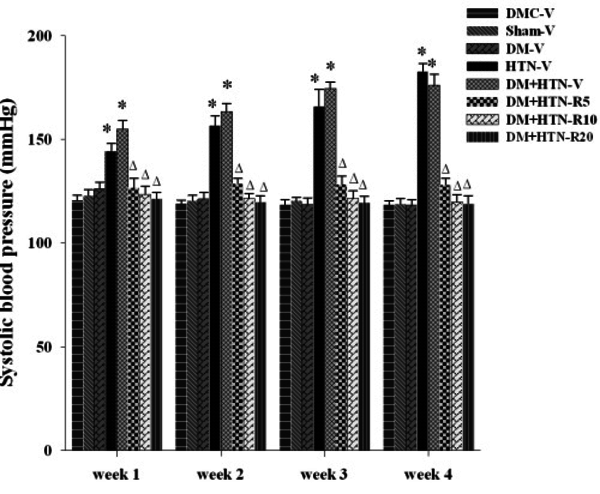 As the figure depicts, the HR of the DM-V group was significantly (P ˂ 0.05) lower compared to the DMC-V and Sham-V groups at weeks 2, 3, and 4, but not week 1, of treatment with the vehicle. Besides, HR was significantly higher in the HTN-V and DM+HTN-V groups compared to the DMC-V and Sham-V groups at weeks 2, 3, and 4, but not week 1, of treatment with the vehicle (P ˂ 0.05). Additionally, the HRs of the DM+HTN-R5, DM+HTN-R10, and DM+HTN-R20 groups were lower in comparison to the DM+HTN-V group at weeks 2, 3, and 4, but not week 1, of treatment (P ˂ 0.05). The weekly FBG levels of all the study groups have been shown in Table 1. Abbreviations: DM-V, diabetic receiving vehicle; DMC-V, diabetic control receiving vehicle; DM+HTN-R, diabetic-hypertensive receiving resveratrol at 5 (R5), 10 (R10), and 20 (R20) mg/kg/day; DM+HTN-V, diabetic-hypertensive receiving vehicle; HTN-V, hypertensive receiving vehicle; Sham-V, sham-operated receiving vehicle. 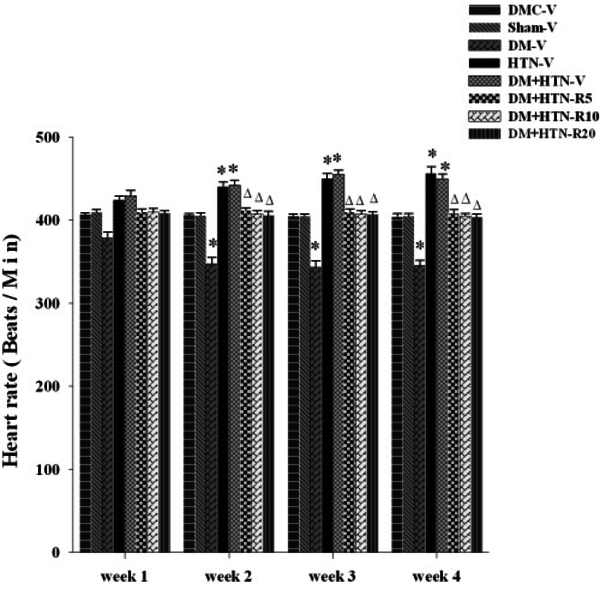 aSignificantly different (P < 0.05) from DMC-V or Sham-V.
bSignificantly different (P < 0.05) from DM+HTN-V. Accordingly, the results revealed no significant difference among the Sham-V, DMC-V, and HTN-V groups regarding FBG levels at weeks 1, 2, 3, and 4 of treatment with the vehicle. However, FBG levels were significantly higher in the DM-V and DM+HTN-V groups (P ˂ 0.05) compared to the control group at weeks 1, 2, 3, and 4 after treatment with the vehicle. Moreover, FBG levels were significantly lower in the DM+HTN-R5, DM+HTN-R10, and DM+HTN-R20 groups (P ˂ 0.05) in comparison to the DM+HTN-V group at weeks 1, 2, 3, and 4 after treatment (Table 1). The results also demonstrated no significant difference among the Sham-V, DMC-V, and HTN-V groups concerning HbA1c level after 4 weeks of treatment with the vehicle. However, HbA1c levels were significantly higher in the DM-V and DM+HTN-V groups (P ˂ 0.05) compared to the DMC-V group. On the other hand, HbA1c levels of the DM+HTN-R5, DM+HTN-R10, and DM+HTN-R20 groups were significantly (P ˂ 0.05) lower than that of the DM+HTN-V group (Table 2). Abbreviations: DM-V, diabetic receiving vehicle; DMC-V, diabetic control receiving vehicle; DM+HTN-R, diabetic hypertensive receiving resveratrol at 5 (R5), 10 (R10), and 20 (R20) mg/kg/day; DM+HTN-V, diabetic- hypertensive receiving vehicle; HTN-V, hypertensive receiving vehicle; Sham-V, sham-operated receiving vehicle; TC, total cholesterol; TG, triglyceride; HbA1C, glycated hemoglobin; HDL-C, high density lipoprotein cholesterol; LDL-C, low density lipoprotein cholesterol. The serum TG, TC, LDL-C, and HDL-C levels of all the groups have been presented in Table 2. Accordingly, there was no significant difference among the Sham-V, DMC-V, and HTN-V groups with respect to TG, TC, and LDL-C levels after 4 weeks of treatment with the vehicle. Nonetheless, the serum TG, TC, and LDL-C levels of the DM-V and DM+HTN-V groups were significantly (P ˂ 0.05) higher than those of the control group. Also, the serum TG, TC, and LDL-C levels of the DM+HTN-R5, DM+HTN-R10, and DM+HTN-R20 groups were significantly (P ˂ 0.05) lower than those of the DM+HTN-V group (Table 2). The results also indicated no significant difference among the Sham-V, DMC-V, and HTN-V groups with regard to serum HDL-C levels after 4 weeks of treatment with the vehicle. However, serum HDL-C levels of the DM-V and DM+HTN-V groups were significantly (P ˂ 0.05) lower than that of the control group. On the other hand, serum HDL-C levels were significantly higher in the DM+HTN-R5, DM+HTN-R10, and DM+HTN-R20 groups compared to the DM+HTN-V group (P ˂ 0.05) (Table 2). Serum levels of oxidative stress markers have been shown in Table 3. Abbreviations: MDA, malondialdehyde; SOD, superoxide dismutase; GR, glutathione reductase; DM-V, diabetic receiving vehicle; DMC-V, diabetic control receiving vehicle; DM+HTN-V, diabetic-hypertensive receiving vehicle; DM+HTN-R, diabetic-hypertensive receiving resveratrol at 5 (R5), 10 (R10), and 20 (R20) mg/kg/day; HTN-V, hypertensive receiving vehicle; Sham-V, sham-operated receiving vehicle. As the table depicts, serum MDA levels were significantly higher in the HTN-V, DM-V, and DM+HTN-V groups compared to the DMC-V and Sham-V groups after 4 weeks of treatment with the vehicle (P ˂ 0.05). However, serum MDA levels of the DM+HTN-R5, DM+HTN-R10, and DM+HTN-R20 groups were significantly (P ˂ 0.05) lower than that of the DM+HTN-V group (Table 3). Furthermore, serum levels of SOD and GR were significantly lower in the HTN-V, DM-V, and DM+HTN-V groups compared to the DMC-V and Sham-V groups after 4 weeks of treatment with the vehicle (P ˂ 0.05). However, serum levels of SOD and GR were significantly higher in the DM+HTN-R5, DM+HTN-R10, and DM+HTN-R20 groups in comparison to the DM+HTN-V group (P ˂ 0.05) (Table 3). The findings of the present study showed that resveratrol did have antihyperlipidemic effects in rats with simultaneous type II diabetes and renovascular hypertension, and that such effects might be related to its antioxidant properties. The results also indicated that the rats with simultaneous renovascular hypertension and type II diabetes had higher SBPs and blood glucose levels compared to the control rats. These findings are in agreement with our previous reports (22). The possible mechanisms for increased blood pressure and glucose levels were also discussed earlier (23). Moreover, our findings showed for the first time that the present rat model of simultaneous renovascular hypertension and type II diabetes was associated with increased serum HbA1c levels. This finding is in agreement with those of the earlier reports, which demonstrated that the experimental model of type I diabetes (24) as well as genetic (25) and experimental (26) models of type II diabetes were associated with increased serum HbA1c levels. The present model of simultaneous type II diabetes and renovascular hypertension was, too, associated with increased serum TC, LDL-C, and TG levels and decreased serum HDL-C levels. Such findings, totally or in parts, are similar to those of other researches using animal models of type I (27) and type II (26) diabetes. The increased blood glucose and Hb1Ac levels and changes in serum lipids have been attributed to destruction of beta cells (28), decreased release of bound insulin (28), decreased insulin sensitivity (29), and increased oxidative stress (30). Therefore, serum levels of MDA, SOD, and GR, as measures of oxidative stress, were evaluated in the current study. Based on the findings, the model was associated with increased oxidative stress characterized by increased serum MDA and decreased serum SOD and GR levels. Such findings are in agreement with those demonstrating increased oxidative stress in experimental models of simultaneous type I diabetes and hypertension (31), simultaneous type II diabetes and renovascular hypertension (32), type II diabetes (30), and type I diabetes (33). Consequently, it may be possible to suggest that the changes in blood glucose and serum Hb1Ac levels and lipids may be partly attributed to changes in oxidative stress. The present study results indicated that resveratrol, at the used doses, did decrease blood pressure and glucose level. These findings are similar to those of our earlier reports (21) and other studies (28). The antihypertensive effect of resveratrol has been attributed to decrease of peripheral vascular resistance (19), down-regulation of angiotensin II signaling and angiotensin II receptors (34), improvement of nitric oxide (NO) response and increase of endothelium dependent vasorelaxation (35), and inhibition of endothelin I-induced contraction (36). Moreover, resveratrol’s blood glucose lowering effects have been related to increase of insulin release (37), enhancement of sensitivity to insulin (29), preservation of beta cells (36), and decrease of oxidative stress (38). Although the effects of resvertatrol on blood lipids have been previously demonstrated in animal models of diabetes (39), the present study represents the first to show such an effect in a rat model of simultaneous type II diabetes and renovascular hypertension. Our findings showed that resveratrol did decrease the harmful serum lipids (TC, LDL-C, and TG) and increased the beneficial one (HDL-C). These findings, totally or in part, are similar to the findings of the previous studies examining the effects of resveratrol in humans (11) and experimental type I (27) and type II (30) diabetes. The previous studies attributed the lipid lowering effects of resveratrol to the inhibition of cholesterol synthesis (32), increase of cholesterol transport (40), decrease of intestinal absorption of cholesterol (39), decrease of activities of hepatic lipogenic and cholesterogenic enzymes such as fatty acid synthase (41), glucose 6 phosphate dehydrogenase (1), and 3-hydroxy 3-methyl glutaryl COA (HMG COA) reductase (1), and inhibition of leptin secretion from adipocytes (3). Thus, the role of oxidative stress was examined in the present study by measuring the serum levels of MDA, SOD, and GR. Our findings showed that administration of resveratrol was associated with increased serum levels of such parameters. Consequently, it may be legitimate to suggest that, in agreement with the previous suggestions (23), the antioxidant effects might partly justify resveratrol’s decrease of serum lipids. The findings of the present study indicated that resveratrol had antihyperlipidemic and antidiabetic effects in rats with simultaneous renal hypertension and type II diabetes. Resveratrol effects might be partly attributed to an antioxidative stress activity. Moreover, our findings might have been able to lay the ground for further research on resveratrol in humans and other animal models of human diseases. This paper was extract from Masoud Mozafari's PhD dissertation financially supported by a research grant from the vice-chancellor for research affairs of Shiraz University of Medical Sciences, Shiraz, Iran (grant No. 91-6339). Authors’ Contribution: Study concept and design: Masoud Mozafari, Ali Akbar Nekooeian, Mohammad Reza Panjeshahin; analysis and interpretation of data: Masoud Mozafari, Ali Akbar Nekooeian, Mohammad Reza Panjeshahin; drafting of the manuscript: Masoud Mozafari, Ali Akbar Nekooeian, Mohammad Reza Panjeshahin; critical revision of the manuscript for important intellectual content: Ali Akbar Nekooeian, Mohammad Reza Panjeshahin; statistical analysis: Masoud Mozafari, Ali Akbar Nekooeian, Mohammad Reza Panjeshahin. Funding/Support: The present study was supported by a research grant from the vice-chancellor for research affairs of Shiraz University of Medical Sciences, Shiraz, Iran (grant No. 91-6339). Implication for Health Policy/ Practice/ Research/ Medical Education: The findings of the present study indicated that resveratrol had antihyperlipidemic and antidiabetic effects in rats with simultaneous renovascular hypertension and type II diabetes. Resveratrol effects might be partly attributed to an antioxidative stress activity. Our findings might have been able to lay the ground for further research on the effect of resveratrol on humans and other animal models of human diseases.